For the girl that doesn't want pink and red everything for Valentine's Day, or maybe she just loves the marble pattern. Here are a few items on my wish list from Zaful. This six-piece marble make-up brush set is not only gorgeous but eco-friendly too. The marble with the rose gold is so pretty, too. Marble studs in round or triangle options are perfect for any stylish friend or family member. They are neutral enough, so they can be worn with just about anything. You'll be shocked at how reasonably priced they are. My favorite marble find at Zaful is the Marble Sports Bra with Mesh Leggings set. The leggings are high-waisted (yes)! All of these items are discounted for the 2018 Zaful Valentine's Sale. This post was made in collaboration with Zaful. All thoughts and options are my own. I love love love! 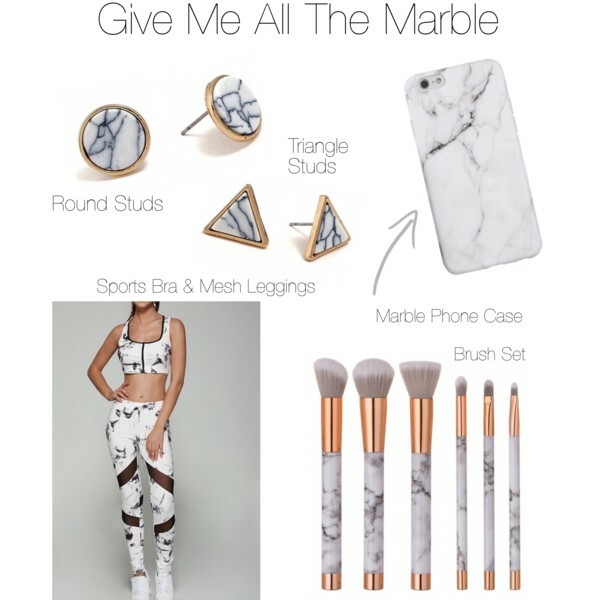 The marble iphone case!!! It is soooo cool!!!!! Thank you! And it's such a steal! LOVE this! The iPhone case is so different than anything you can commercially buy! Thank you for the ideas! Thank you. Yes, I love the sophisticated look of it. That is a nice design. I like the pattern and color. Hey, thanks! I appreciate you stopping by my page!